Last week we looked at the Bento Rodrigues mine disaster. Today we are looking at a number of other sights to be seen in the satellite imagery from 2015. We found most of the locations with the help of DigitalGlobe’s First Look map. Tropical Cyclone Chapala struck Yemen on November 3rd, 2015. 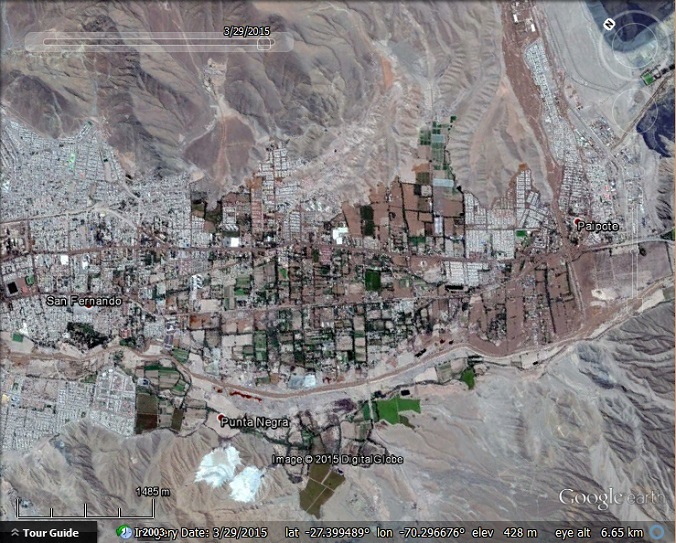 Google Earth has some images from a couple of weeks later, which show a number of bridges and roads washed away. A washed out bridge in Yemen. Tocopilla, Chile experienced landslides and flooding in August, 2015. The imagery is not very good quality but we were able to find the location below where some houses have been washed away. The Copiapo River in Atacama, Chile, flooded in March. As you can see in this article it was more mud than water. The slightly darker browns indicate the extent of the flooding. Villarrica before and after the eruption. A chemical spill in the Animas River from the Gold King Mine near Silverton, Colorado. Chambers Bay Golf Course while the US Open for 2015 was in progress (not a lot can be seen). Some flooded houses in South Carolina from the flooding that occurred in October. The 2015 Dubai Air Show. An oil spill from an attack on an oil field in Libya in February.